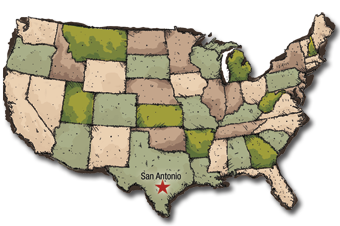 Motor Freight shipping across continental U.S. Feeding fish by hand to maximize their growth can be a time-consuming task, and it may not always be possible in adverse weather. Texas Hunter Products offers a more convenient solution — our largest solar-powered fish feeder on the market. This Texas Hunter fish feeder features a 250-pound feed capacity, allowing you to attract as many fish as possible with little refilling. Its innovative timer, dual motors and distribution system work together to deliver exceptional performance in any weather. At the heart of the pond fish feeder lies its Premium Digital Timer — a system we’ve fine-tuned to deliver feed at precise times every day. Set the timer to dispense food between one and nine times throughout the day. You can then rest assured your timer and system are working like they should at the push of a button. While an included 12-volt battery powers the feeder, the battery’s charge can be maintained with an optional solar charger (sold separately). The solar operation means you’ll no longer need to worry about your battery status — just mount the charger to any side of the fish feeder for all-day reliability. We strive to offer the utmost convenience in our fish feeding products with options such as these. Buy your American-made automatic fish feeder from the outdoor experts. Order now or check out our full selection of fish feeders to view your options. You can also contact us with any questions. Click the button below to add the Texas Hunter Fish Feeder - 250 lb. Fish Feed, 425 lb. Corn Capacity – with Adjustable Legs to your wish list.